This was not on the beging a wallpaper for minitokyo. I learned this morning do proper clouds and brushing them and mixing the colors, but then i remembered on one picture i found a couple of month on the internet. I was ready do vector it, but i imagine Miku in the middle of the starry clouds and it was perfect for me so. I riped Miku from the picture and added the copy in the middle. 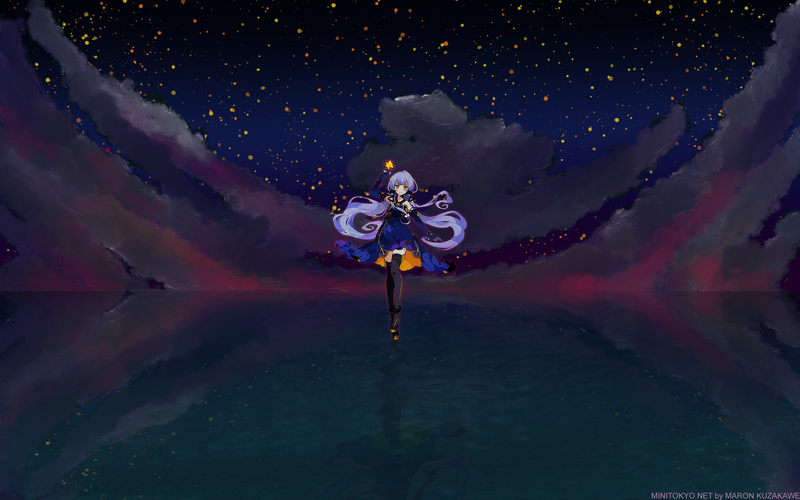 I cleaned the edge little, do one more copy of Miku with multiply effect and set glowing on 10. BG- as i write i was learning from this bg so at first i painted with round brush the clouds with more colors. Then i do some water paint with proper brush and mixed the colors. The details are only round brush set to 5pt. The water is basic brush, mixed colors and at final stage aded proper brush as the wavy water.